This interesting evergreen fern produces large, tongue-shaped fronds. 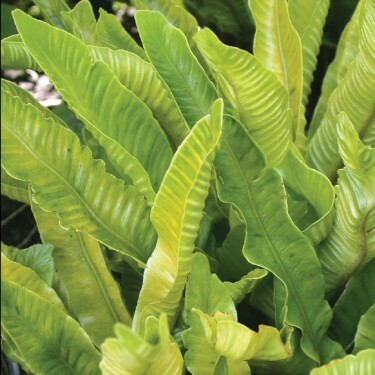 Commonly known as Hart's Tongue Fern, Phyllitis scolopendrium has fronds that are shiny, leathery, bright green, up to 16" long. This fern is particularly unmistakable, having a broad undivided leaf with stripes of sori (spore-producing areas) underneath. It is most commonly found along damp walls, in ditch-sides or shady woods.